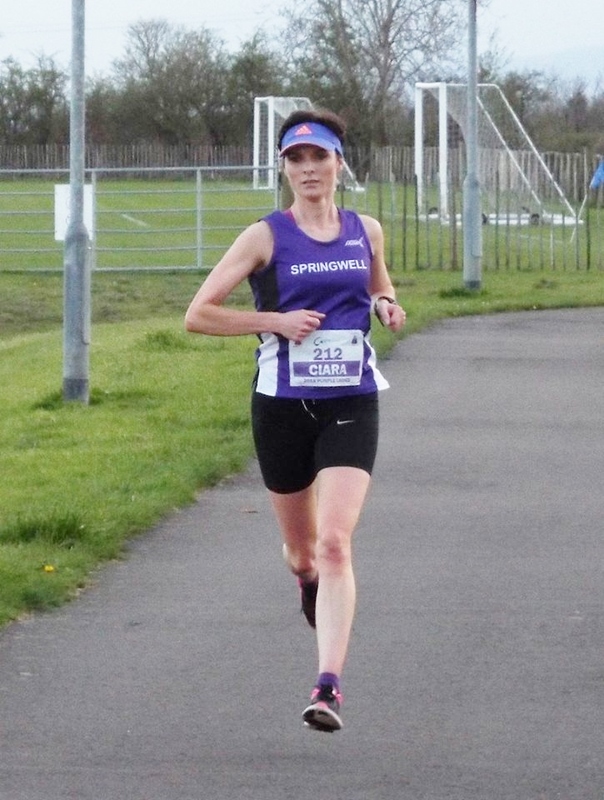 It has been a week of exceptional performances for Springwell Running Club, with the clubs men’s and woman’s marathon records being broken on the same day, albeit at different events at opposite ends of the continent. The SSE Dublin Marathon on Sunday 28th October attracted over 16,000 runners to the city. The cold, calm weather was in stark contrast to last year’s tropical temperatures, and offered the prospect of faster times in near perfect running conditions. Springwell RC’s Ciara Toner has had a fantastic season so far this year but all the efforts thus far were an end to her performance in the 2018 SSE Dublin Marathon. Running in only her second Marathon, her first being the Belfast Marathon in 2012, Ciara finished 356th, 16th in the ladies race and the first N.I. lady to cross the line in an impressive time of 2.53.36. This took over ten minutes off the current club lady’s record for the marathon, with Ciara being the first Springwell RC lady to run under three hours for the distance. On a day of impressive performances Steven Magill, David Jackson and David McAfee recording sub 3 hour marathons with 2.57.20, 2.58.55 and 2.59.07 respectively and, just outside the 3 hour mark with 3.00.05; Hugh Boyle won the M65 age category. On the other side of the continent Springwell RC had three members taking part in the Frankfurt Marathon. As in Dublin the cold, although slightly breezy weather conditions made for perfect marathon running conditions. Having already broken his club Half Marathon record this year Simon Stewart went to the start line in a rich vein of form and confident of producing a time close to his club record for the marathon. After being beset with injury at the start of the year Stephen Fillis was targeting this race as a return to form and, although only taking part in his second marathon, Aaron Moffatt had high hopes on the day. As it turned out all three athletes produced excellent performances with Simon leading the three home in a new club record of 2.35.25 to finish 156th. Aaron finished 942nd with a personal best of 2.58.51 while, completing a day of personal bests in Frankfurt, Stephen ran 3.04.33 to finish 1207th. The start of the clubs weekend of marathon success started on Saturday 27th October at the East Antrim Marathon Series event, where Helena Dornan ran 3.57.58 in some very cold and blustery conditions to win the ladies race. Springwell RC was also represented at the event by Sarah Dickinson. This year’s NI & Ulster Even Age Group XC Championships too place on Saturday 27th October at the CAFRE Campus in Antrim. Taking place during the late morning and early afternoon the junior races suffered from the worst of the weather with rain, hail and strong winds making for challenging running conditions. In the U12 Girls age group Eobha McAllister ran 7.56 to finish 9th while in the U16 Boys Ryan Smith was 10th with a 13.10, resulting in both of them qualifying to run in the Irish Cross Country Championships in Abbotstown, Dublin. The final race of the day at the CAFRE Campus on Saturday was the Bobby Rea Memorial Cross country with the Senior and Masters men taking part in the 5 mile event. With the race starting at 3.00pm the worst of the day’s weather had passed and the race started in bright sunshine and a cold breeze. Work on the drainage at the campus meant that the course was in excellent condition, resulting in some fast times. Springwell RC are represented at events all around the world and this weekend was no exception with Becky Coulter running the Barfoot & Auckland Half Marathon, Auckland New Zealand, finishing in 1.54.35.